Shortly before leaving home this morning to come to my studio, I spotted outside one of my favorite birds — an Evening Grosbeak — which I’ve seen none of for several years. On this windy raw November morning, as I stood transfixed and delighted, the gathering grew till there were at least ten, males and females both in winter plumage, working over the Japanese Maples just off the back deck, plundering the clinging samaras with apparent gusto. Utterly beautiful birds, with their dramatic black, brown, gold and white coloring and massive beaks. They were certainly on their way South from nesting grounds farther North, scarfing down gourmet seeds and washing it all down with water from the hand-carved stone basin under the (now leafless) red maple. Since this species of Grosbeak doesn’t nest here, this was a rare thrill. The glow remains with me now in the afternoon, on an especially dreary day. Just finished weaving the second of three silk shawls on the current warp on BL before taking a break for lunch. Need to do the beaded hemstitching first thing tomorrow when (I hope) the natural light in here will be stronger, and then can move on to the last one. This is the “Evening in the Garden” series, on a hand-dyed silk warp, each with a different weft and a markedly different pattern. Simple 16-shaft straight twill threading, with complicated tie-ups and treadling sequences in the design, resulting in sinuous curves in the cloth. I’m pleased with how they’re looking; one is off the loom (cut it off last week so as to have it ready for our Whidbey Weavers Guild annual sale) and is exceptionally elegant. Next warp onto the BL will be for fabric for a special-order vest plus two shawls, in cobalt blues, indigo, black and grey. Warp yarns specially dyed by The Drop Spindle, and quite glorious indeed. 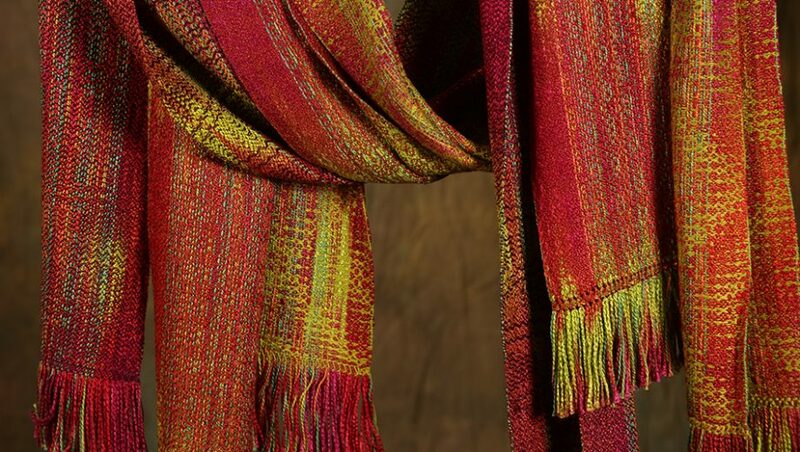 I’ll add a couple of stock yarns to pull in additional color and texture, thread a 12-shaft straight twill, and weave the fabric in a lovely swinging undulating twill I’ve designed. My sprained left ankle and foot — result of a nasty fall ten days ago — are finally starting to ease up on the pain quotient, and the swelling is significantly reduced. Sure has slowed down my weaving output, as treadling tends to cause increased pain and swelling if I do too much without elevating and icing the pitiful appendage. I’ll be seeing my beloved acupuncturist this afternoon, and anticipate an uptick in healing speed as a result. That’ll be a relief.